What does "color quality" mean when making judgments of printed color reproductions? Color Essentials, Volume 2, continues the series designed to help develop one’s color quality judgment and analysis skills through another set of fourteen essays on color principles as they relate to everyday graphic arts color reproduction issues. 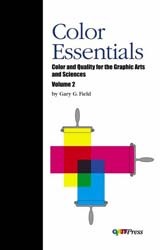 Once again, Gary G. Field explores the technical, practical, and perceptual facets of color quality through essays focusing on topics such as color vision, ink-paper color, ideal color sequence, color systems engineering and color printing dynamics. Informal yet scientific in nature, these succinct essays stress principles and offer new insights into how the subjects apply to everyday graphic arts color reproduction issues. Reference listings of supplemental technical and scientific publications suggest avenues for further in-depth study. About the Author: Gary G. Field, the author of Color and Its Reproduction(PIA/GATFPress), is an Imaging Scientist and Professor at the California Polytechnic State University in San Luis Obispo, California.